Sela, Ori 2017. “To Feel at Home in the Wonderful World of Modern Science”: New Chinese Historiography and Qing Intellectual History. Science in Context, Vol. 30, Issue. 03, p. 325. Will, Pierre-Étienne 2010. Citadins et citoyens dans la Chine du xxe siècle. p. 353. He, Ping 1995. Perception of identity in Modern China. Social Identities, Vol. 1, Issue. 1, p. 127. Wasserstrom, Jeffrey N. 1992. Towards a social history of the Chinese revolution: A review: Part 1 : The evolution of a field1. Social History, Vol. 17, Issue. 1, p. 1. Roberts, J.A.G. 1989. Warlordism in China. Review of African Political Economy, Vol. 16, Issue. 45-46, p. 26. 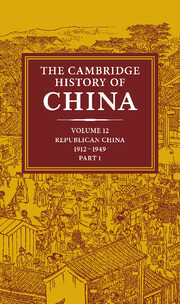 This is the first of two volumes of this authoritative Cambridge history which review the Republican period, between the demise of imperial China and the establishment of the People's Republic. These years from 1912 to 1949 were marked by civil war, revolution and invasion; but also by change and growth in the economic, social, intellectual and cultural spheres. The chapters examine economic trends in the period and the rise of the new middle class. Intellectual trends are surveyed to show the changes in traditional Chinese values and the foreign influences which played a major role in Republican China. Although it is written by specialists, the goals and approach of this Cambridge history are to explain and discuss republican China for an audience which will include scholars, students and general readers who do not have special knowledge of Chinese history. It will be useful both as narrative history and as a reference source on the history and politics of China. The 37 years from 1912 to 1949 are known as the period of the Chinese Republic. This chapter discusses one of the major historical issues, events and Chinese achievements in these various realms. Some of the seemingly 'foreign influences' on the Republican Revolution have coincided with or grown from older Chinese trends that shared certain traits with the foreigners. The chapter indicates the dimensions of this historical problem. It also tries to establish the identity and trace the growth of Maritime China, a peripheral region along the south-east coast. The growth of treaty-port trade in China brought with it the new technology of transport and industry, a new knowledge of foreign nations, and so a growth of nationalism. The rebel tradition, secret and fanatical, had been too often in the negative guise of Boxerism, profoundly anti-intellectual and likely to degenerate into local feuding. This chapter surveys the history of the Chinese economy from the end of the Manchu dynasty to the establishment of the People's Republic. While the quantitative indicators do not show large changes during the republican era, China in 1949 was nevertheless different from China in 1912. Modern industrial, commercial and transport sector for the most part remained confined to the treaty ports. The census-registration of 1953-54-54 reported a population of 583 million for mainland China. In describing the Chinese economy in the closing years of the Ch'ing dynasty, it is noted that at least 549 Chinese-owned private and semiofficial manufacturing and mining enterprises using mechanical power were inaugurated between 1895 and 1913. China's economy in the republican era was overwhelmingly agricultural. Neither the 'distributionist' nor the 'technological' analysis of China's failure to industrialize before 1949, is by itself satisfactory. Poorly developed transport continued to be a major shortcoming of the Chinese economy throughout the republican period. The foreign establishment in early republican China had many facets: territory, people, rights established by treaty or unilaterally asserted, armed force, diplomacy, religion, commerce, journalism, freebooting adventure, racial attitudes. This chapter describes briefly the dimensions of each of the principal guises in which the foreigner impinged upon the polity, economy, society and mind of China. In the absence of modern financial institutions in China, the early foreign merchant houses undertook to provide for themselves many of the auxiliary services such as banking, foreign exchange and insurance essential to their import-export businesses. However, by the second decade of the twentieth century, 12 foreign banks were operating in China. In the first two decades of the twentieth century, 85 to 90 per cent of China's foreign trade by value was carried in foreign flag vessels. The foreign presence was highly visible in three departments of the central government: the Maritime Customs Service, the Post Office and the Salt Administration. The years immediately following the Revolution of 1911, when Yuan Shih-k'ai was president of the first Chinese republic emphasizes the beginnings of warlordism. It also stresses the continuities with the pre-revolutionary years and sees the Revolution of 1911 as an early climax in a nationalist movement to invigorate politics and society. The ambiguity of the revolutionary aftermath began with the negotiated settlement of the revolution itself. The social conservatism of the 1911 Revolution and the scope given to gentry power in the new order make understandable such politics among those most oppressed. It was apparently believed, at least by Yuan Shih-k'ai, that the switch to a monarchy would keep the Japanese, with their own monarchical proclivities, at bay until the war ended. It appears that the two failed political experiments of the early republic liberal government and dictatorship contributed to each other's destruction. Yuan's dictatorship collapsed with themonarchy. The death of Yuan Shih-k'ai in June 1916 ushered in the era of the warlords and yet throughout the ensuing decade of militarism, the Peking government remained the symbol of China's national sovereignty and hoped-for unity. Constitutionalism served the interests of ex-bureaucrats and professionals because it offered them legitimate political roles without opening the political arena to the groups below them. The popular support it could command would provide the key to wealth and power for China. The institutional facade of the Peking government was constitutional: legislative, executive and judicial functions parcelled out by law, policy decisions made by institutional procedures. The reality was factional: personal followings, cutting across the boundaries of official institutions, each faction centred on a particular leader. Constitutionalism could not restrain the brutal forces. The tide of change washed the wealthy and fortunate ashore in the foreign concessions of treaty ports. The constitutional system exhausted its own vitality through its members' absorption in factional struggles. The time between 1916 and 1928 is commonly called the 'warlord period'. While warlords used such personal ties to cultivate the loyalty of their officers, their subordinates often had similar relationships with their own juniors. Some commanders tried to minimize these secondary loyalties, and focus all allegiance directly on themselves, but it was difficult to eliminate them. The percentage of public revenue actually devoted to public purposes evidently declined in most provinces through the warlord era. The chaos of warlordism, and the concomitant weakness of the Peking government, rendered China peculiarly vulnerable to foreign pressures and encroachments. This chapter looks at some events to note how militarism supervened and finally supplanted the vestiges of constitutionalism. On the one hand, the warlord years represented the low point of political unity and national strength in the twentieth century. On the other hand, they also represented the peak of intellectual and literary achievement. The 1898 reform movement was an effort at institutional change on the part of ranking literati close to the throne. Where it had been directed at the inherited political order, the intellectual campaign for a totally 'new culture', which was symbolized by the May Fourth demonstrations of 1919, was seen as an attack upon the traditional moral and social orders. Filtered through the interpretive matrix of reform cosmology, science and democracy appeared to be the material and social manifestations of a total cosmic order linked to the ultimate ends of ta-t'ung. The history of neo-traditionalism through the May Fourth period saw the gradual supplanting of the first connotation by the second. Between the reform and the movement, three neo-traditional currents may be discerned, each with its own strategy for adapting Confucianism and the classical heritage to modern conditions. They were the National Essence movement, Liang Ch'i-ch'ao's call for 'new people' and modern relevance of the central spiritual symbols of Confucianism. Many factors combined to create the great intellectual upsurge of 1919 and the early 1920s that in the Chinese fashion has been given a neutral numerical designation as the 'Five-four' movement. The main focus of this chapter is on themes and issues which were to dominate the discourse of the intellectual stratum during the May Fourth period and after. The grandest and most enduring theme of all is the theme of historical or evolutionary progress as first interpreted in the writings of the great pioneers like K'ang Yu-wei, Yen Fu, and T'an Ssu-t'ung. The Chinese Revolution of 1911 produced no social revolution. One of the more significant conflicts which emerged out of the winds of doctrine of the May Fourth period was the debate between Hu Shih, Li Ta-chao and others concerning the question of 'problems versus -isms'. Another outcome of the May Fourth movement was the whole 'neo-traditionalist' reaction against the 'totalistic iconoclasm' of the movement. The study of modern Chinese literature is burdened with China's modern history. It origins can be traced to the late Ch'ing period, more specifically to the last decade and a half from 1895 to 1911. This chapter commences with a discussion on this period. For at least two decades before the 'literary revolution' of 1917, urban literary journalism, had already established the market and the readership for the latter-day practitioners of New Literature. Two prevalent forms of fiction writing can easily be discerned on the late Ch'ing literary scene: the social novel and the sentimental novel in which the central focus is on human emotions. For the May Fourth youths 'riding on the tempestuous storm of romanticism', 40 love had become the central focus of their lives. By the May Fourth period, Su Man-shu's legacy, had become a new convention: foreign literature was used to bolster the new Chinese writer's own image and lifestyle. Before the founding of the Chinese Communist Party (CCP) there were even special magazines for or about the working man which provided information on workers and peasants, fostered a new attitude towards labour, and drew attention to some of the most serious social problems. In the case of China between 1917 and 1921 the conversion to Marxism involved the perception of Chinese reality on the part of the converts, their personal temperament and traits, and their understanding of the doctrine itself. Lenin's theses on the agrarian and national and colonial questions presented before and at the Second Congress of the Communist International (CI) in July 1920 probably remained unknown to the early Chinese Marxists. The Boxer uprising and Russia's role in it drew Lenin's attention to China, but it was the Chinese and other Asian revolutions. Towards the end of the first united front, the party could perhaps influence some three million factory, mining and railway workers. The Nationalist Revolution of the 1920s succeeded because of a remarkable mobilization of human energy and material resources in the service of patriotic and revolutionary goals. This chapter discusses the rejuvenating the Kuomintang, creation of a revolutionary military force, conflict in the Kwangtung base, and the Russian financing of Chinese revolutionary activities. The patriotic purposes of the Northern Expedition was to liberate China from the warlords and win its rightful place of equality among the nations, with friendship for all. The disastrous Canton uprising, engineered by a small group of daring Chinese communist leaders to carry out general instructions of the new Provisional Politburo in Shanghai, marked a low point in the Communist Party's long struggle for power. Now the country had five main agglomerations of regional military power: the group proclaiming itself the Nationalist government, the Kwangsi faction, Feng Yii-hsiang's Kuominchiin, Yen Hsi-shan of Shansi, and Chang Hsuehliang and other Manchurian generals controlling domestic affairs in the North-east. The wartime and post-war years formed the golden age of the Chinese bourgeoisie. However, the return in force of the Chinese bureaucracy, first under the Kuomintang, then under the communist regime, could not obliterate the bourgeoisie's contribution to the modern, democratic and internationalist tradition that emanated from the May Fourth movement, any more than it could prevent the eventual resurrection of this tradition. The Revolution of 1911 was not a bourgeois revolution. Among the non-official local elites who would be the first to benefit from the movement, the merchant class, as we have seen, played an increasing role. The National Bankers' Association, Chinese Cotton Millowners' Association and new business associations adopted the viewpoint of an international capitalism dominated by the themes of growth, progress and competition. Compared with this permanent phenomenon of dependence vis-a-vis the world market, the return in force of the bureaucracy and the decline of the entrepreneurial bourgeoisie assumed only secondary importance. This chaper presents essays on republican period, the economic trends from I9I2 to 49, Peking Government, the warlord era and the intellectual history of the reform generation supplement to the first and second series came out before the two volumes of the fourth part of the second series. An original study of the May Fourth phenomenon is Lin Yii-sheng's challenging work. Surveys in Chinese from a Marxist viewpoint, focused on the period around 1919, include Hua Kang and Ch'en Tuan-chih. The principal bibliographic work on the CCP before 1949 has been done by Japanese scholars, who have listed especially documents held in archives in Taiwan and articles published in major serials. The involvement of the Chinese bourgeoisie in the revolution of 1911 marked its emergence on the political scene. The chambers of commerce and the business associations, despite the essential roles they played between 1911 and 1927, remain poorly known. Birch, Cyril. ‘English and Chinese meters in Hsu Chih-mo’. Asia Major, NS 8.2 (1961) 258–93. Chang, Shou-yung et al, comps. Huang-ch'ao chang-ku hui-pien (Collected historical records of the imperial dynasty). 100 chüan. 1902; Taipei reprint: Wen-hai, 1964, 3 vols. Chang, C. M. ‘Local government expenditure in China’. Monthly Bulletin of Economic China (formerly Nankai Weekly Statistical Service), 7.6 (June 1934) 233–47. Chao, Erh-hsun et al., eds. Ch'ing-shih kao (Draft history of the Ch'ing dynasty). 536 chüan, in 12 cases. Peking: Ch'ing-shih kuan, 1928; Mukden, 1928, rev. edn 1937; Shanghai reproduction, etc. Ch'en, Tu-hsiu. Pien-shu-chuang (My defence). 20 Feb. 1933, n.p. ,Commission for the Investigation of the Shakee Massacre. June Twenty-Third: the report of the Commission for the Investigation of the Shakee Massacre June 23, 1925, Canton, China. Canton: Wah On Printing Co., n.d. (1925), distributed ‘with compliments of the Commission’. Fang, Achilles. ‘From imagism to Whitmanism in recent Chinese poetry: a search for poetics that failed’, in Frenz, Horst and Anderson, G. A., eds. Indiana University conference on Oriental-Western literary relations, 177–89. Chapel Hill: University of North Carolina Press, 1955. Howard, Richard C. ‘The concept of parliamentary government in 19th century China: a preliminary survey’. Paper delivered to University Seminar on Modern East Asia – China and Japan, Columbia University, New York, 9 Jan. 1963. Hsia, C. T., ed. Twentieth-century Chinese stories. New York: Columbia University Press, 1971. Hsieh, Pen-shu ‘Lun Ts'ai O’ (On Ts'ai O). Li-shih yen-chiu (Historical studies) (Nov. 1979) 47–61. Hu, Shih. ‘Ting Wen-chiang ti chuan-chi’ (A biography of Ting Wen-chiang), in yuan-k'an, Chung-yang yen-chiu-yuan, no. 3, 1956. Also separately printed, n.p., n.d.
Huston, J. Calvin. ‘Peasants, workers, and soldiers revolt of December 11–13, 1927 at Canton, China’. Dispatch no. 669 to MacMurray, J. V. A., U. S. Minister to Peking, 30 Dec. 1927. In Hoover Institution on War, Revolution, and Peace, Stanford, California, J. Calvin Huston Collection, Package II, Part II, Folder 5, Item 20. Lu, Hsun. Fen (Graves). Shanghai: Ch'ing-kuang shu-chü, 1933. Mann, Tom. What I saw in China. London: National Minority Movement, 1927? Mao, Ssu-ch'eng. Min-kuo shih-wu-nien i-ch'ien chih Chiang Chieh-shih hsien-sheng (Kai-shek, ChiangMr up to 1926). N.p. (1936); Taipei edn (1948?) Often referred to as ‘Chiang's Diary’. Min-pao (People's journal). 1–26 (Sept. 1905-Sept. 1908). Reprinted by K'o-hsueh, , Peking, 1957. 4 vols. ,Ministry of Defence. shih-cheng-chü, Kuo-fang-pu. Pei-fa chanshih (A battle history of the northern punitive expedition). 4 vols. Taipei, 1959; another set bound in 10 ts'e; another edn published at Yangming-shan: Chung-hua ta-tien pien-yinhui, 5 vols., 1967; our citations are to the 4 vols. 1959 edn. ‘Shang-hai shih-chih chin-hua shih-lueh’ (Brief history of progress of the Shanghai municipal system), in she, Shang-hai t'ung ed. Shang-hai yen-chiu tzu-liao (Research materials on Shanghai), Shanghai: Chung-hua shu-chü, 1936; Taipei: Chung-kuo ch'u-pan-she, 1973. 75–8. Teng, Yen-ta. Teng Yen-ta hsien-sheng i-chu (A posthumous collection of Mr Teng Yen-ta's writings). Preface (1949) by I-t'ang, Yang. Hong Kong: n.p., n.d.
Vishnyakova-Akimova, Vera Vladimirovna. Dva goda v vosstavshem Kitae, 1925–1927: vospominania. Moscow: Akad. Nauk SSSR, Institute of the Peoples of Asia, Izd–vo ‘Nauka’, 1965.